Question: How did the language and methodology of Kabbalah change depending on the stage of development of humanity? Kabbalists wrote in a language that cannot be comprehended. Answer: Actually, for centuries Kabbalists wrote only for people like themselves. No one was engaged in popularizing Kabbalah. If we look at the developmental process along the axis of time beginning with Adam until the end of all development, a very interesting structure forms from the year zero to the year 6000. During this period there was growth of egoism. First, Adam revealed the spiritual methodology, after him, Abraham and Moses did. Then, the First and the Second Temples were built and destroyed. 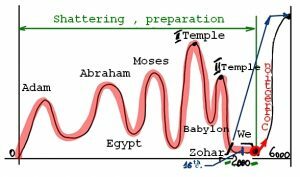 And now begins the rise toward the Third Temple. Until we come to the point of ascent (“We” in the drawing), all development was automatic, according to the initial command. There was nothing unpredictable. Only from the point where “We” are begins the correction. And all the time prior to that was the period of shattering and preparation. That is why, all that occurred prior to our time was known to absolutely all Kabbalists, without any surprises. And only starting from our time does freewill emerge and the dissemination of Kabbalah begin for all of humanity. People start to become enlivened and to connect themselves and their future with the methodology of correction. From the current state of the world, it becomes apparent that the world’s correction is possible only by strengthening the connections between people. It turns out that the methodology that gives us the opportunity to create this connection is now being revealed. How Should We Treat History And Traditions?